Availability: Mass Retail I got mine from Wal Mart for $8.44 US before tax. Each of Mattel’s 12 inch Halo figure is in a tall slender box with the top half of the figure showing through a window. Several of the other figures are shown on the back of the box. 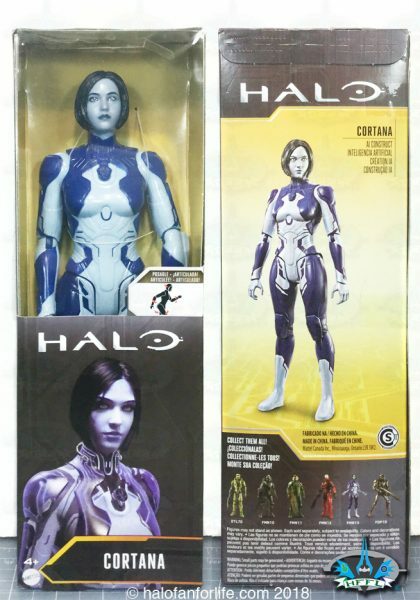 In the box you get Cortana only, no accessories. Here’s a close-up of Cortana’s Torso/Head. I think she’s the best detailed figure of Mattel’s 12 inch Halo line. Look at the face. VERY realistic! Mattel did a great job here. Here is Cortana in orthogonal views. 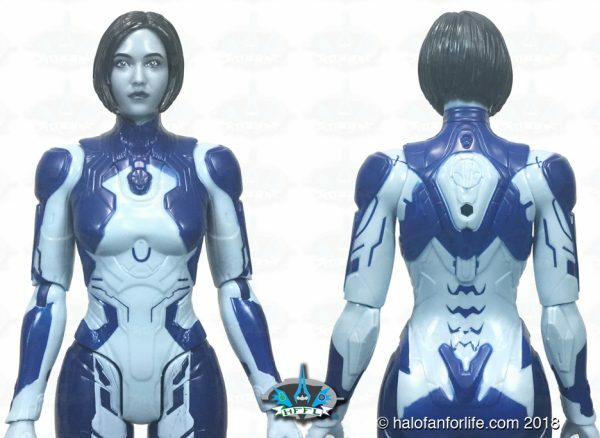 Of all the 12 inch Mattel halo figures, I feel Cortana is the one that is closest in proportion. She doesn’t looked abnormally stretched tall as the other figures do. The articulation of the 12 inch Mattel figures in comparison to the 6 inch figures is less. However, the 12 inch figures cost less than half of the 6 inch ones. Therefore, less articulation is acceptable, in my opinion. Sculpt: Excellent! By far, Cortana is the best of all of Mattel’s Halo 12 inch figs. She needn’t worry about huge armor which allows for this figure to be thin and not look out of proportion. 10 of 10 medals! Accessories: As Cortana comes with no accessories, I won’t have a rating for this category.So instead of the usual 50 medals, for this review, I’m dropping that to 40 medals. Overall: 36.5 of a total 40 medals. Affordability here is KEY. Do I recommend this product? MOST DEFINITELY! For one, Cortana toys are hard to come by. She’s not often made into merchandise. When she is, she usually doesn’t linger on store shelves. This one is no exception to that. I’m hoping to find another one to keep in the box. Yes, I know, that’s a rare thing for me. But this figure is just that GOOD! Strangely enough, years ago, I predicted a Cortana Barbie doll. We didn’t get exactly that, though I think this one will do quite well! Below is my April Fool’s joke of a Cortana Barbie. I had my wife paint one up to look like her. If this review gives you an informed decision on whether to purchase the toy or not, please consider a small donation (50 cents) to the blog.You can donate via PayPal to jedisalpitt2002@yahoo.com. Or just click the paypal link at the right on the main page of the site. It’s much appreciated and helps ensure that HFFL stays registered/active on the internet. Thank You. This entry was posted in Mattel by Sal. Bookmark the permalink.